These Rules and Regulations were written under the auspices of The University of the West Indies, Campus Registrar and form part of the University Administrative Code. The operation and parking of a motor vehicle on The University of the West Indies, St. Augustine Campus is a privilege granted by the University. The following measures were introduced in the University’s attempt to provide staff, students and visitors with parking on the Campus fairly and equitably. Parking facilities for both students and visitors are available at the TGR North and South Car Parks, situated along the western perimeter of the University compound, at the northern and southern ends respectively. Additionally, the Heart Ease car Park, situated on Wooding Drive, just north of The UWI Sport and Physical Education Centre (SPEC) west gate, and the JFK East Car Park, situated at the southern end of the University compound, east of the South Gate and south of the JFK Food Court, are reserved for parking by students with valid UWI Parking Permits only. Student Parking Permits are issued annually in Semester 1 of each academic year and are valid through July 31 of the same academic year. Permits should be requested from the Campus Security Services Department at the beginning of Semester 1. It is the responsibility of the student to apply for the relevant permit. The security personnel on duty at the entrance to the TGR North Car Park issue Parking Cards to persons upon entry, which must be returned to the security personnel upon exit. Should the Parking Card be lost, the cost of replacement is twenty-five dollars ($25.00). Weekdays (between the hours of 6:00 p.m. and 6:00 a.m. only). A shuttle service is provided to convey students and visitors using the TGR North Car Park to and from the JFK Underpass (up to 7:30pm) or the Student Activity Centre (after 7:30pm). After parking their vehicles, students and visitors should proceed through the pedestrian gate at the car park shuttle stop shelter and board the shuttle at the pick-up point in front of the shelter. The shuttle runs every ten (10) minutes from 6:30 a.m. until the last stop at 8:30 p.m., Monday to Friday. Designated car parks/parking lots on the Main Campus, unless otherwise indicated, are provided for staff members’ vehicles. Parking facilities for Executive members of the Guild of Students, Ministers of Government, Diplomats, handicapped persons, retired senior staff members and persons with appointments are also clearly identified. Limited reserved bays are available to operators of commercial outlets on the Main Campus. Appropriately marked vendor, delivery or commercial vehicles engaged in official business with UWI may be permitted to go about that business without obtaining a permit. The vehicle, however, must be clearly and permanently marked on both sides. Except for vehicles owned by The University of the West Indies and medical students who are “on call”, no vehicle should be parked in any of UWI’s garages/parking lots for more than 24 hours at a time. This includes motorcycle parking. The Director of Security is responsible for the issuing of all Parking Permits. 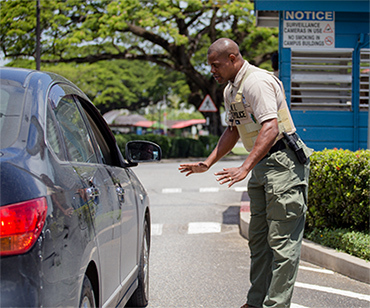 Parking Permits are not only required for parking, if available, but also for permission to use the roads within the UWI compound. Parking Permits authorize the persons to whom, and the vehicles for which, they are issued to drive on the campus and to park in designated parking areas, if there is space available. Limited parking is available on a first come first, first serve basis. Therefore possession of a Parking Permit does not guarantee the availability of a parking space. Parking Permits are issued annually from Semester 1 of each academic year and are valid through July 31 of the same academic year. It is the responsibility of all owners/operators of vehicles to apply for and display a valid parking permit on the vehicle’s front windscreen/ dashboard. Vehicles not properly displaying valid parking permits are subject to penalties for parking violations.